I haven't really heard of Tarina Tarantino before today so I took a glance at her site. It was very interesting seeing how she started out, just selling odd bits she had made in her apartment. Going from model-makeup artist-jewelery designer. I know its not relevant but I love her pink hair! 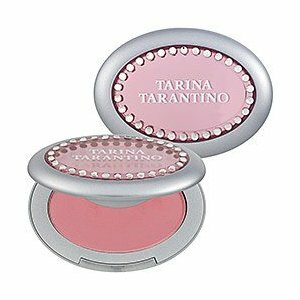 Dollskin Cheek by Tarina Tarantino is a blush devised to provide cheeks with a natural glow that lasts all day long. It is also designed to be crease and fade resistant. Tarina says, "Unique micronization technology provides the most ultra-fine particle size possible, which results in enduring, crease- and fade-resistant application". There are 5 different shades available, these should be suitable for all skin tones. By layering higher pigmented definition can be achieved. It is made without parabens, which are preservatives used in a lot of cosmetics and some pharmaceuticals. Talc, Zinc Stearate, Octyldodecyl Stearoyl Stearate, Octyldodecyl Stearate, Silica, Nylon-12, Caprylyl Glycol, Phenoxyethanol, Red 28 Lake (CI 45410), Manganese Violet (CI 77742). Dollskin blush has first class reviews with patrons admiring the great color that glides on for a natural look. They also like how it feels kind of creamy on their skin. There was one user that wasn't bowled over by this product. She says the color is dull and it made her look pasty. It is quite lavishly priced at $25 a go but most patrons think it is worth it. You are currently browsing the archives for the Tarina Tarantino category.